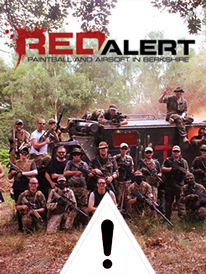 Red Alert Paintball has taken every reasonable step to ensure the content of these web pages is fully accurate and correct in every detail however it does not warrant or make any other representation as to the content, extent or completeness of the information, text, graphics, links or other items contained in this website or any other related website. All information and content found on this website is provided without any warranties, either express or implied, including, but not limited to, warranties of title, non-infringement or implied warranties, other than those warranties which are incapable of exclusion, restriction or modification under applicable law. At no stage shall Red Alert Paintball, our affiliates or our licencors be liable for any direct, indirect, punitive, incidental, special or consequential damages that result from the use of, or inability to use, this website or from information provided by the website. This limitation applies whether the alleged liability is based on contract, tort, negligence, strict liability or any other basis, even if we have been advised of the possibility of such damage. Because some jurisdictions do not allow the exclusion or limitation of incidental or consequential damages, our liability in such jurisdictions shall be limited to the extent permitted by law. All prices quoted for booking packages are for payments made in person (at a paintball centre). Payments made this way are final and cannot be altered or amended in any way – meaning that once paid you will not be able to change the date of your booking and if any member of your party is unable to attend on the date of your booking then that payment is forfeited and no credit places issued. When confirming your booking with payment, there is no transaction fee charged for using a debit card. The minimum age of all players on the date of the game is 11 years old. Any player under this age on the game date, without special dispensation, will not be allowed to play. For Splatmaster at the minimum age is 6 years old.